Cool blue soothing gel formulated to calm, soothe, hydrate, and balance the skin. There are many factors that have an effect on the appearance and overall health of the skin. Stress, fatigue, and dehydration can cause the complexion to appear dull and lifeless. 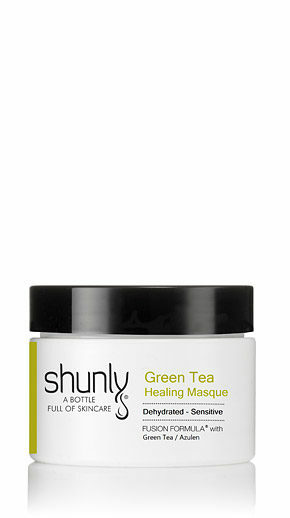 Green Tea Healing Masque is specifically formulated to rescue a dull complexion by delivering oxygen and nourishment to the skin. Following various skin treatments and procedures, the skin can sometimes become irritated and experience discomfort. This Green Tea Healing Masque is best to soothe and reduce irritation due to sunburn, body waxing, extractions, chemical peels or laser treatments. It is very beneficial for dry, dehydrated and sensitive skin. 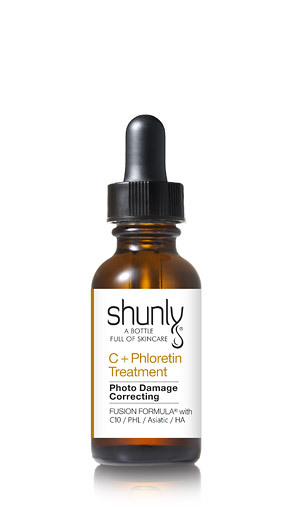 Apply a thin layer to the cleansed and toned skin, neck, and décolleté two to three times a week. Avoid direct contact with eyes. Leave on 10-15 minute, and rinse off with water. Follow with Shunly pH-Toner. Aqua, Aloe Barbadensis Leaf Juice, Glycereth-26, Polysorbate 20, Sodium Hyaluronate, Hydrolyzed Glycosaminoglycans, Camellia Sinensis (Green Tea) Leaf Extract, Azulene Centaurea Cyanus (Cornflower) Flower Extract, Symphytum Officinale (Comfrey) Leaf Extract, Lavandula Angustifolia (Lavender) Oil, Disodium EDTA-Copper, Carbomer, Xanthan Gum, Phenoxyethanol, Caprylyl Glycol, Sodium Hydroxide. Love how my skin feels after using this masque. I will be making this a part of my skin care routine.